Rocketboom has a great video clip from graffiti research lab, eyebeam and the anti-advertising agency on nyc’s graffiti problem inspired by jo lee’s abstractor tv. Watch it, wonder, and get inspired! 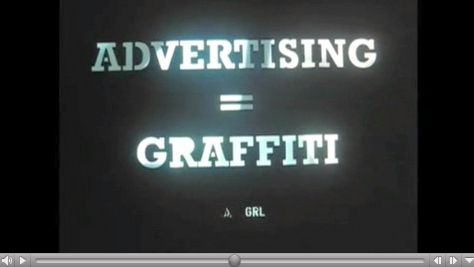 I never thought about advertising this way, but this video made me realize the obvious. update:Here’s an interesting follow up to this story where a simple marketing ad campaign turns into graffiti which then turns into a huge media blitz on being a bomb threat in Boston considered to the big media an act of terriorism when it is hardly even that. If you have not heard about this somewhat stupendous media buzz yet incredibly successful marketing act, follow up on the story on some great coverage here, here, here, or the many links here….then the great sign to “the media” about what they should cover here! This entry was posted on Saturday, January 27th, 2007 at 3:14 pm	and is filed under art, brand, entertainment, ideas, information, inspiration. You can follow any responses to this entry through the RSS 2.0 feed. You can leave a response, or trackback from your own site.